It’s been a long time since I last showed you what’s on my desk and as I have recently been cleaning and organising it a bit, so I thought that I would show you it again. On my desk are some paper pads I picked up from Homesense that I thought might give me some inspiration. There are some fabrics that I won in a giveaway from Paper and Strings and a card that I has been sitting on my desk for about 3 months unfinished as I haven’t been feeling like making cards but finally finished it with some sequins. Also my 5 year old loves when I stamp her some images on paper so that she can colour them in, that’s what I am off to do now. 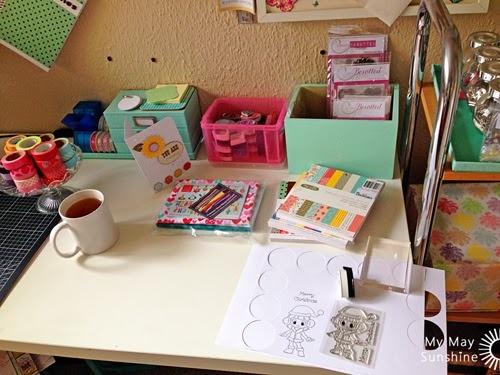 Linking up with Julie @ Stamping Ground.